Feb 20, 2014 webinar — Register Online. I’m happy to announce my upcoming webinar: How to Make Dorset Buttons. Join me on February 20, 2014 at 1pm EST. These special buttons have a fascinating history. For three hundred years, intricately patterned buttons were produced in Dorset, England. Most often, these small, soft buttons were made by wrapping linen thread around a wire ring. With the invention of machine-made buttons in the mid-nineteenth century, the Dorset button industry all but disappeared. I’m excited to share tips and tricks for making beautiful buttons using both traditional materials and modern knitting yarns in this live presentation. 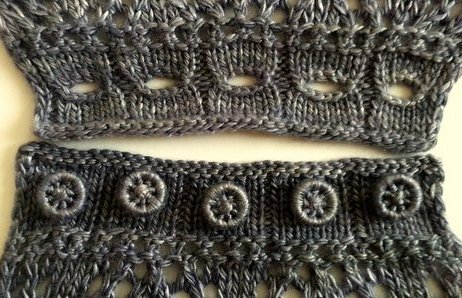 I’ve also included a knitting pattern that incorporates Dorset buttons to get your creativity flowing. 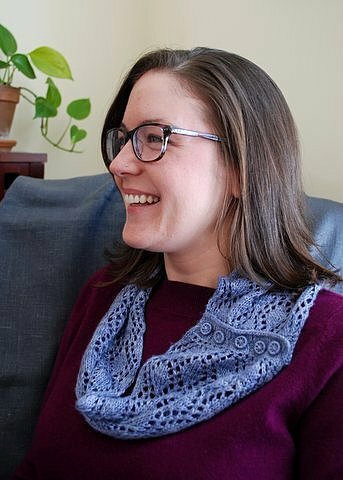 The Gold Hill Cowl combines a straight-forward lace pattern with my favourite one-row buttonhole—a great way to show off your button-making skills!